I'm Here. I'm Queer. What the Hell do I read? 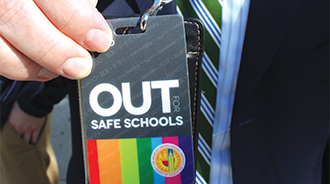 : OUT for Safe Schools - a very cool program that started in Los Angeles and is now going to nine other school districts in the U.S.A.
OUT for Safe Schools - a very cool program that started in Los Angeles and is now going to nine other school districts in the U.S.A. I love the sound of this program! Since the introduction of the OUT for Safe Schools initiative, thousands of teachers and staff members have been wearing rainbow badges to identify themselves as LGBTQ allies and protectors of LGBTQ students. Now, nine other school districts throughout the country – in New York, Chicago, Boston, San Francisco, San Diego, Duval County (Florida), San Francisco and Washington, D.C. – have requested the program, along with more than 80,000 badges. The program encourages educators, administrators and other school district employees to “come out” and be visible allies for LGBT students in an effort to make the schools safer, more welcoming places. Remember, there's no such thing as a closeted ally. Let's put that to a hashtag, shall we? So important - to be visible, take a supportive mindset and turn it outward for all to see. And act on.